﻿ Leopard bling cuffs - reviews on EdenFantasys. 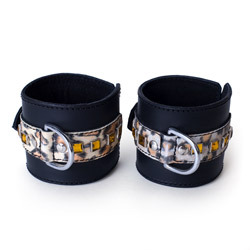 The Leopard Bling Cuffs are wrist or ankle cuffs with the cute design of leopard print and yellow/orange studs. These cuffs are made of leather with a suede back. The cuffs aren't padded and the back is really rough. The buckle and D-ring are made of metal, but this metal has many surface flaws to it. The cuffs are effective for light use, but serious users won't be impressed. They do accommodate a wide range of sizes, but best suited for larger wrists. The price tag attached to this item may be worth it due to the quality of the material and the stitching, but the faux leopard print combined with the cheesy amber-colored studs is sad. It would have been sexier it were all black. The Bling cuffs are going to hold down most people, and with the right outfit, can be used as an edgy accessory. They are built to last and are a lot of fun to use, just don't use them to hang your partner out to dry. A real deal, no chains attached!